I am excited to lead off my blog with my favorite original design. 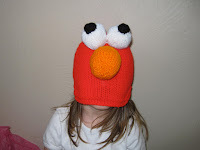 I was inspired to knit my niece Taryn an Elmo hat for her second birthday because she loved Elmo at the time. I made a hat to fit her head (or so I thought, it ended up stretching and being big enough for me at the end) and then knit some balls for eyes and an elongated ball for the nose. 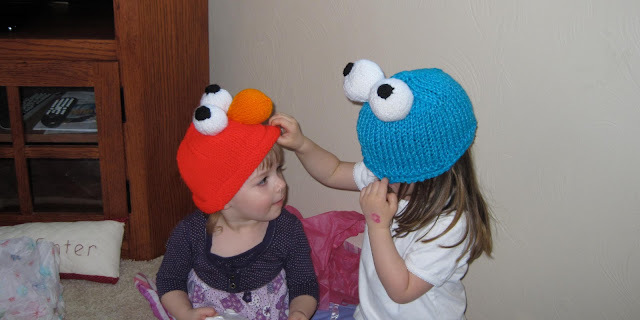 Even though it was too big, the kiddos still enjoyed playing around with the hats, hopefully as much as I enjoyed making them! The pattern for the Elmo hat can be found here. This is the first pattern I have ever written, so please let me know if there are any corrections or if you have any questions. The Cookie Monster hat can be made just like the Elmo Hat, but with blue yarn and without a nose. 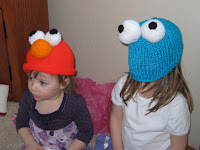 As you can see, my hats were too big and when I made the hat again, I was sure to make my hat smaller and the appropriate size for a toddler. My niece's cousin, Kennedy had fun showing just how big the hats were by pulling them down over her head. For a tutorial on embroidering the eyes, click here. 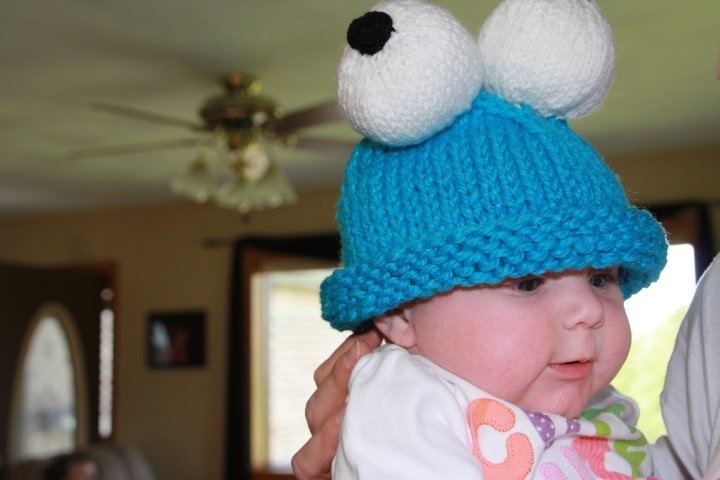 What type (brand) of yarn did you use for cookie monster? I used some that I found on Craigslist so I don't know the exact brand. 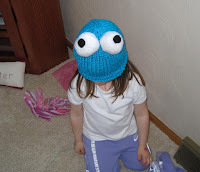 However, I have since found Loops and Threads Charisma yarn in electric blue to be a good option for cookie monster.